Walking can help pave the way to fitness. But are you taking enough steps to get results? Using a pedometer can help you set and achieve fitness goals. A pedometer can offer motivation and accountability. See how to choose and use a pedometer — it can be a powerful reminder that every step counts on the path toward better health. A pedometer is a device that senses your movement to tally up the number of steps you take. A pedometer counts steps for any activity that involves step-like movement, including walking, running, stair climbing, cross-country skiing and even movement as you go about your daily chores. To use a pedometer, you usually just clip it onto the waistband of your pants, tuck it inside your pocket or even slip it into a purse held close to your body — and then get moving. But how do you know which kind of pedometer to get? Review these features to see what pedometer may best suit your needs and interests. Ease of use. Some pedometers have more features and require more setup than do others. For instance, before first using your pedometer, you may have to program the date and time, your weight, or calculate and input the length of your stride. 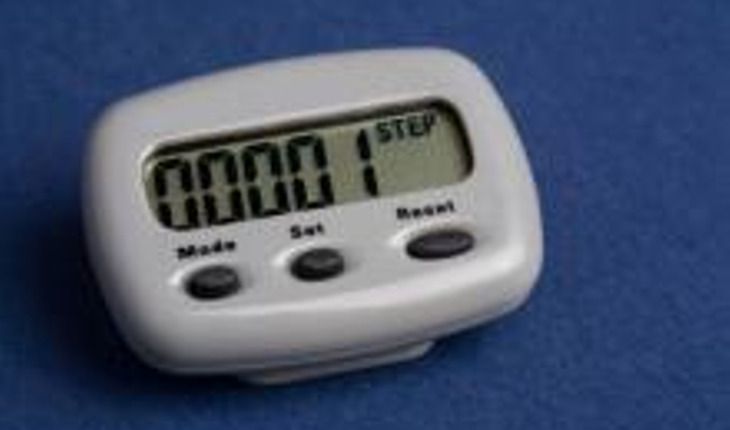 With other pedometers, you just clip it on and go, resetting the steps to zero each day when you start over. Extras. Some pedometers do nothing more than count your steps. Others can calculate time spent in an activity, distance walked and even the number of calories your burn up while being active. Still others allow you to upload your data to computers so that you can electronically track your progress. Accuracy. Most pedometers are generally accurate and reliable at counting basic steps. It's harder for pedometers to accurately measure actual distance you walk or run and harder still to estimate calories burned. The type of waistband your pants have, your speed and even your waist size also can affect pedometer accuracy. Check the manufacturer's instructions to achieve optimal accuracy for your pedometer. Display. Look for a pedometer with a display monitor that you can read in different types of lighting, especially if you'll be using it both indoors and outdoors. Comfort. Choose a pedometer that fits well with the type of clothing you usually wear. Consider the size and weight of the pedometer. Most pedometers are small, so you're not likely to notice them as you walk or work out. Sturdiness. Look for a sturdy clip to secure the pedometer to your waistband. A pedometer may also have a strap to hold it in place and prevent it from being lost if it becomes unclipped. Price. The cost of a pedometer typically depends on how many features it offers. Pedometer price generally ranges from $10 to $50. You can buy a pedometer at fitness stores or online. Mobile devices. If you're into gadgets and technology, you can use a pedometer application for your smart phone or other mobile device. These applications (or apps) can count steps, distance and calories, much like a traditional pedometer. Prices vary, with some basic apps being free. Reprinted from mayoclinic.com. For more information, visit mayoclinic.com.